A perfect mix of comfort and nature, this treehouse stay in Shimla gives you the chance to relax and unwind in the heart of Himachal's mountains. You'll spend the night in pinewood treehouses, built with a private balcony overlooking rolling green hills as far as the eye can see. With views so gorgeous, you can spend the entire day mesmerized by the plush greenery, or you can head out to explore the charming hill station of Shimla. At an additional charge, you can also participate in activities like guided nature walks, wildlife spotting, village visits or cycling. In the evening, you can put your feet up in the balcony and drift into sleep stargazing at hundreds of twinkling dots in the night sky above you. 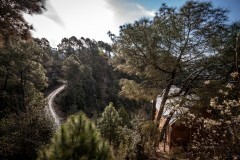 Hidden in the secluded hills just outside Shimla, your treehouse resort is surrounded by thick jungles of pine and deodhar, overlaid on sprawling mountains on all sides. Built with traditional Himachali architecture, the treehouses are made from wood and stone, over a raised platform on terraced mountain slopes. This is a perfect option for travellers looking to escape the hustle of the modern world, for a relaxing holiday spent in the mountains of Shimla. Your comfortable treehouses are equipped with a double bed, coffee table, chairs, television, mini-fridge, private balcony and an attached washroom with running water. Delicious meals are served buffet-style at the in-house restaurant, built with a stacked-stone design. • Spend a night in comfortable treehouses with beautiful views. • Getaway from the city for a relaxing holiday. • Visit and explore the hill station of Shimla on your own. • Rest with gorgeous views in your private balcony. This is a non-strenuous activity. However, travellers with any pre-existing medical conditions are advised to consult with their personal physicians before booking this treehouse stay in Shimla. 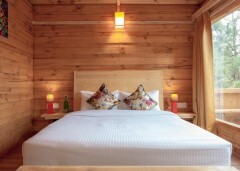 For cancellations made 15 days or more before the check-in date of Shimla treehouse stay: 80% refund. 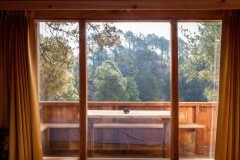 For cancellations made 2-14 days before the check-in date of Shimla treehouse stay: 50% refund. 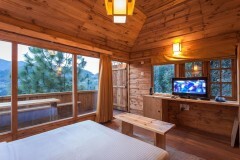 For cancellations made less than 2 days before the check-in date of Shimla treehouse stay: no refund. Check-in time at the Shimla treehouse resort is 14:00 hrs, check-out time at the Shimla treehouse resort is 12:00 hrs. Early check-in and late check-out is subject to availability. Please carry a government-issued ID card to be produced at the time of check-in. Bookings for children younger than 6 years are not charged. 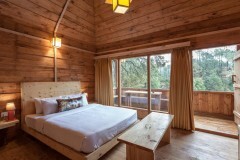 Bookings for children older than 6 years and for extra traveller in the treehouse are charged at INR 2,500 per person. There is no pick-up for this Shimla treehouse stay. There is no drop-off for this Shimla treehouse stay. 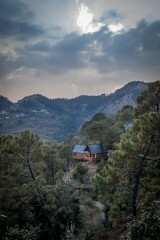 Day 1 of the Shimla treehouse stay: Check-in and enjoy! 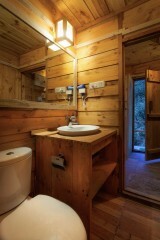 Arrive at the treehouse resort near Shimla and freshen up in your gorgeous pinewood treehouses. You can spend the resort of the day at leisure. Relax in your room with beautiful mountain views or head out to explore the hill station. 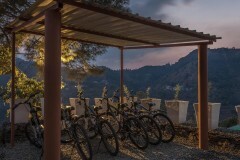 At an additional charge, you can also book activities like guided nature walks, wildlife spotting, village visits or cycling. Return to your treehouses by late evening to have dinner and spend the night stargazing from your private balcony, overlooking the forest. Overnight in treehouse rooms in Shimla. Sprawling mountains of Shimla all around you. Wake up to a lazy morning with morning views of the green hills. After breakfast, you'll check-out of the treehouse resort by 12:00 hrs. Your trip ends here. Personal expenses such as apparel, extra meals, beverages etc. Overnight in treehouse room at Shimla. Check-in time is 14:00 hrs, with early check-in subject to availability. You'll be accommodated in luxury treehouse rooms made from pinewood, equipped with a double bed with a mattress, pillows and blankets. Other amenities in the room include a coffee table, chairs, an LED TV, a tea/coffee maker, a mini-fridge and a safe. You'll have access to a private balcony and an attached washroom with a glass cubicle, rain shower and geyser. Today's meal package includes dinner only. Inside view of treehouse rooms. Today's meal package includes breakfast only. All meals are served at the restaurant that can prepare Chinese or European cuisine. Check-out time is 12:00 hrs. Depending on availability, you can even extend your stay at the resort. The treehouse resort, accessible via road, is located 22-km/1-hr drive away from Shimla. You can travel to Shimla via railway trains from Chandigarh or Delhi, and hire a private cab to reach the treehouse resort.